Climate change is a risk to health both nationally and globally. It has been described as the greatest public health threat of our time, whilst tackling it is considered the greatest global health opportunity of the 21st century. It is not just a scientific argument but a challenge with human health and wellbeing at its core. It affects all aspects of our everyday life. Our environment, including the places we live, the air we breathe, as well as our access to food and water and even global migration. The direct impacts of climate change may not be as immediately visible in the UK as they are in those parts of the planet where glaciers and ice sheets are breaking up, they are nonetheless real in the UK. Much has been done in the UK to both plan for, and act ahead of, the impacts of climate change. It is ten years since the UK published the landmark Climate Change Act (2008), the first Act of Parliament of its kind worldwide. The Act specified targets to reduce carbon dioxide emissions and committed the UK to an assessment of climate change risk every five years and a programme to subsequently prepare for the identified risks. In 2012, PHE’s predecessor body the Health Protection Agency published a far reaching report, the Health Effects of Climate Change, profiling the scope of risks the UK would face due to the forthcoming changes. And although that document painted a clear picture of the climate risks facing the UK it’s fair to say that even since then, just six years ago, the scale of challenge presented by climate change to the UK has become even clearer. 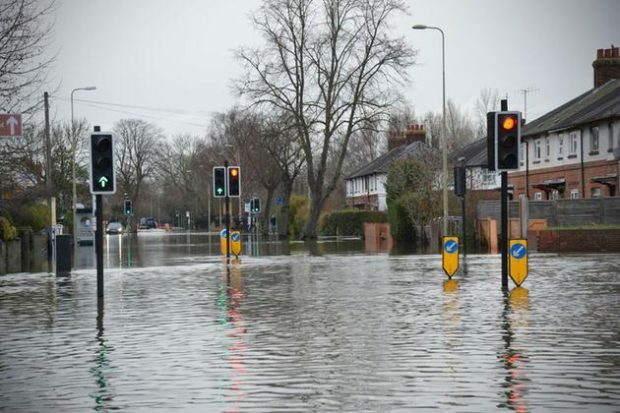 The most recent Climate Change Risk Assessment, published in 2017, identified increases in the frequency and intensity of flooding and heatwaves as two of the most likely impacts associated with climate change in England. These have been identified as priority areas where more action is needed. Extreme weather events already have a significant impact on public health through increased deaths and ill health. These events also affect health and social care services as people who are impacted seek support but also as the services themselves are affected, for example, by flooding of essential buildings or overheating of care homes. What these instances tell us is that climate change isn’t a future risk, the impacts are occurring now. We know that 20 percent of homes are currently overheating in today’s climate, and 90 percent of hospital wards are of a type prone to overheating. With an ageing, growing population and no intervention, these impacts will get considerably worse; for instance, heat-related deaths in the UK are projected to increase by around 250% to over 7,000 by the 2050s. So what do we do now and is the public health system doing all it can to prepare for, and where possible mitigate these impacts? First and foremost we must continue to develop the multidisciplinary evidence base and contribute to science that supports government policy and operational response. Understanding the impacts climate change and the effective interventions available to protect public health are vital if we’re to prepare for the negative impacts associated with a changing climate. At PHE we have research programmes in evaluating the public health impacts associated with extreme weather events to ensure lessons are learned and incorporated into long term planning. This work is being constantly fed into national plans, such as the Cold Weather Plan and Heatwave plan for England, and the policymakers tasked with devising complex strategies to contend with our changing climate. Secondly, the challenge presented can feel too big or too distant to tackle – if we’re to combat climate change, everybody and every little thing will help. We all need to play our part by using the car less, and public transport or walking more, by thinking a bit more about what we eat, opting for more climate friendly foods - vegetables instead of meat, and by doing what we can to reuse, recycle and reduce the amount of waste we generate. As we know, quantifying the health impacts of action or non-action in this area is notoriously difficult and attribution of single extreme weather events to climate change remains challenging. As with most public health interventions, the benefits of today’s action may not be realised for a decade or more. What public health and the wider healthcare system can do however, is ensure that climate change is considered alongside current health priorities such as obesity and Type 2 diabetes. It is only when these issues are viewed in the round that we give ourselves the best chance of a brighter, safer future; one where we capitalise on the opportunities presented by a changing climate whilst simultaneously adapting to the negative consequences. Subscribe to our blog to receive notifications of new posts.